I wouldn’t let myself get too snobby before trying out one of the new Chery J11 SUVs. Value for money, and a decent drive, make the new and refurbished J11 the best entry level SUV on the market. Chery hasn’t been around the ranks for long, but with a neat new design, and loaded with some great features, it’s vehicles like the J11 that will help create a loyal following. The new design is leagues ahead of the outgoing model and has a similar appearance to some five-door Toyota RAV 4s. A nice high waistline, trapezoid headlights and a unique, attractive front nose really does show the Chery J11 off nicely. It’s a modern design, and looks much more trim and agile than the previously slightly overweight J11. If you’re driving the earlier model J11 than I reckon the time might be now for you to trade up and enjoy the fresh new Chery SUV. Not only have the Chinese given the Chery J11 SUV a heart replacement, there is a comprehensive list of safety features that guide and protect in the event of an emergency situation – as well as systems in place for accident avoidance. Airbags are situated in the front and sides of the front occupants, while features like the rear parking sensors with a distance display aid for moving around tight spaces has to be a great feature for those who might find city driving difficult. Now you can be seen even better during the day time with LED daylight running lights revealing your presence to other road uses. Hill hold assist makes starting off an incline a breeze, and active safety features like electronic stability control (ESC) and ABS braking keep you moving in the right direction. Cruise control is a standard feature, and one of my must have features on any new car. Comfortable seating for five adults and a generous amount of luggage space means that the new Chery J11 is an ideal wagon for taking the family away for a weekend away. The rear seats do split in a 60/40 type ratio, making lengthy objects easier to carry. If the rear seats are folded down flat, there is a very useful 790 litres of luggage space available. Features like the AM/FM radio, CD Player with USB Input, MP3 Compatibility, and four speaker sound make travelling around listening to your favourite tracks a nice way to pass the time. 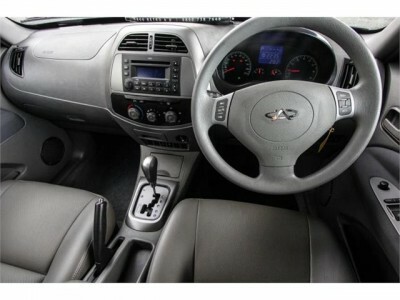 The Chery J11 comes standard with audio controls mounted on the steering wheel for ease of use. Air Conditioning works very well to keep the environment inside the new J11 balanced and comfortable. Speaking of comfortable, the leather seats really do feel great, and look smart and luxurious. One of the areas that Chery has made a huge leap forward over the outgoing J11 is in engine design. This new Chery J11 SUV is mounted with China’s first DVVT engine that utilizes an advanced air intake and exhaust technique to create more power and better efficiency. Engine power has thus improved by up to 6% and fuel consumption has improved by up to 20% – a huge advancement. The new 1.6-litre DVVT 4-Cylinder engine is a feisty little unit that promises to be robust and efficient. 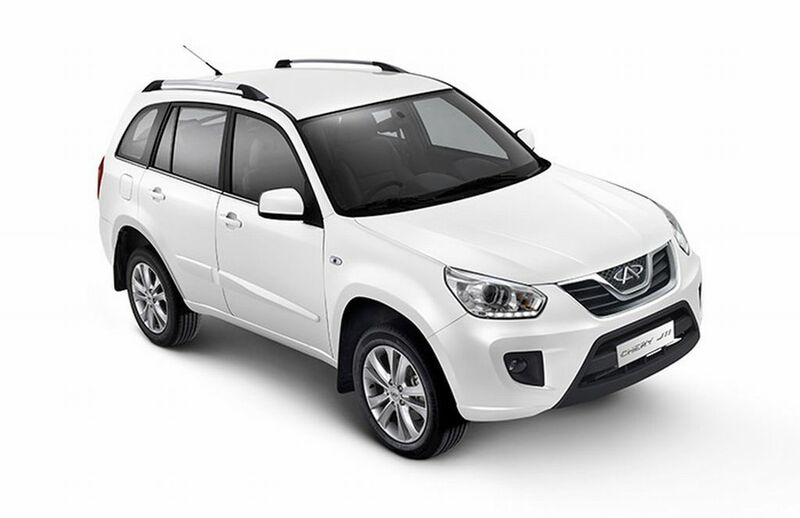 Low cost 2WD SUV running might not get any better than with a new Chery J11. A choice of either a five-speed manual or seven-speed CVT transmission will link the power to the rear driving wheels, and fuel consumption for your average drive is around the 8 litres/100 km mark. Both the Chery J11 CVT Automatic and Chery J11 Manual boast a 3 Years/100,000 km warranty as standard, and some of the optional equipment available includes things like headlight covers, a Bluetooth Kit and a dash mat. Look the part in a very reasonably priced brand new Chery J11 SUV today. Come and see us, and we’ll get you sorted. For any more information on the new Chery J11 SUV or, for that matter, any other new car, contact one of our friendly consultants on 1300 303 181. If you’d like some fleet discount pricing (yes even for private buyers! ), we can submit vehicle quote requests out to our national network of Chery dealers and come back with pricing within 24 hours. Private Fleet – car buying made easy!